Indiana's vast variety of habitats lends itself to a wide collection of snakes. Some prefer wooded habitats while others prefer open meadows. Water snakes and those that prefer marshes or other wetlands are also present. Encountering a venomous snake is rare in Indiana, but all four venomous species are pit vipers that can be identified by their elliptical pupils, their triangular heads and the heat-sensing pits behind their nostrils. Of the over 30 species of snake found in Indiana, only four are venomous, and all four are pit vipers. The four species of venomous snake found in Indiana are the timber rattlesnake (Crotalus horridus), eastern massasauga rattlesnake (Sistrurus catenatus catenatus), northern copperhead (Agkistrodon contortrix mokasen) and western cottonmouth (Agkistrodon piscivorus). Timber rattlesnakes inhabit a small area in south-central Indiana; the eastern massasauga is an endangered species that inhabits northern Indiana. Only a small, isolated population of cottonmouths exists in south-central Indiana. Copperheads have the largest range of any venomous snake in the state: it spreads across southern Indiana into areas of central Indiana. The black racer (Coluber constrictor) varies in color from black in the southern part of the state to blue in its northern range. Both color varieties exist in Indiana. These snakes are quite large, reaching lengths of 5 feet. The black rat snake (Elaphe obsoleta obsoleta) is particularly large, growing up to 8 feet long. These snakes are particularly good climbers and are often encountered in the rafters of barns and other structures. Both racers and rat snakes are constrictors. Many of Indiana's snakes are patterned with colorful stripes, bands or blotches. Milk snakes (Lampropeltis triangulatum) have rust-colored blotches with thick, black outlines on a whitish-gray background. Brown snakes (Storeria dekayi) are light brown with a row of diamond-shaped spots along each side of their backs. 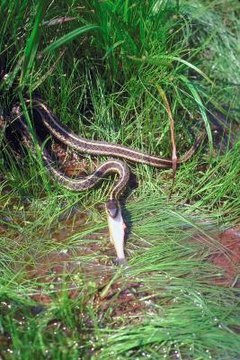 The garter snakes (Thamnoophis spp.) of Indiana typically have conspicuous stripes along their green to black bodies. Some species also have spots or a checkerboard pattern. Indiana is home to a few species of water snake. The northern water snake (Nerodia sipedon sipedon) and midland water snake (Nerodia sipedon pleuralis) inhabit the north half and south half of the state, respectively. Sometimes mistaken for copperheads or cottonmouths due to their dark-brown-and-tan pattern, these snakes are completely harmless. The queen snake (Regina septemvittata) is an olive-green to olive-brown color with a distinctly yellow belly. Kirtland's water snake (Clonophis kirtlandi) is an endangered species found in the northern two-thirds of the state.